I am so happy I made the decision to get my A-Z posts written and scheduled - because, without that linky link, it's crazy having to scroll through hundreds of comments, to place mine. It all seems out of control. Some days, I don't even list it. I realize the linky link was hard to maintain - they need to relinquish control and let others help with that. I also believe they need several linky links for categories. One for the Writers and Artists, Personal or Lifestyle blogs, and Adult content. I think that would do it. They could at least try it one year- they tried it without the linky links this year...like I said, it's about relinquishing some of their control. It is getting huge. Has anyway watched FIVE CAME BACK on Netflix? We watched it last night - Documentary on the five Hollywood Directors that served during World War 2 and their wartime contributions - and how it changed their lives. John Ford, William Wyler, John Huston, Frank Capra, and George Stevens. EXCELLENT! I had already decided I wasn't doing A/Z this year before the list was eliminated. I personally liked the list, though I know it was hard to maintain it. It did get frustrating to see a blog on the list with no activity for a few months, but at the same time I was frustrated helping out to look for blogs like that and when I reported them, they weren't removed from the list. I'm not sure I would like the linky thing they are doing this year. I found great blogs through the list in the past A/Z's that I still am following to this date 4-5 years later. But it is wise to get the posts written ahead of time. Less stressful and more time to visit new blogs you might enjoy. We really enjoyed it. My husband also watched some of the war documentaries that the directors made - those were on Netflix too. I'll put that movie in my Netflix list. I'm going to have to live to at least 100 to watch and read and travel to everything on my lists. I too am glad I wrote all my posts ahead. Just trying to follow the new blogs I have found, answer comments, and read through the list is mind-boggling. I am amazed that there are so few postings each day on the A to Z site as opposed to the nearly 2000 that were on the linky list. So I am not sure that either way is ideal. It's just different - Takes some getting used to and of course, I don't do change real well. Takes me while. Oh I am the same way with all the classic books I want to read or re-read, movies and of course traveling. I agree, it is a bit out of control. I hope someone sees your suggestions. And I wanna watch it so bad! Definitely will once I have some free time. Separating the lists by type is a great idea. You consistently blog with good posts. 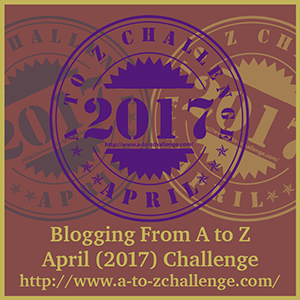 The A to Z helps you to meet people and find other blogs.